Thread: Can you help me identify these extra parts. As is often the case, whenever I take a machine apart I end up with extra parts. Can you help me identify where these might go? What kind of machine do you have? That could make identifying them a little bit easier. The model number could also help. Also what part of the machine no longer works, or sounds funny? 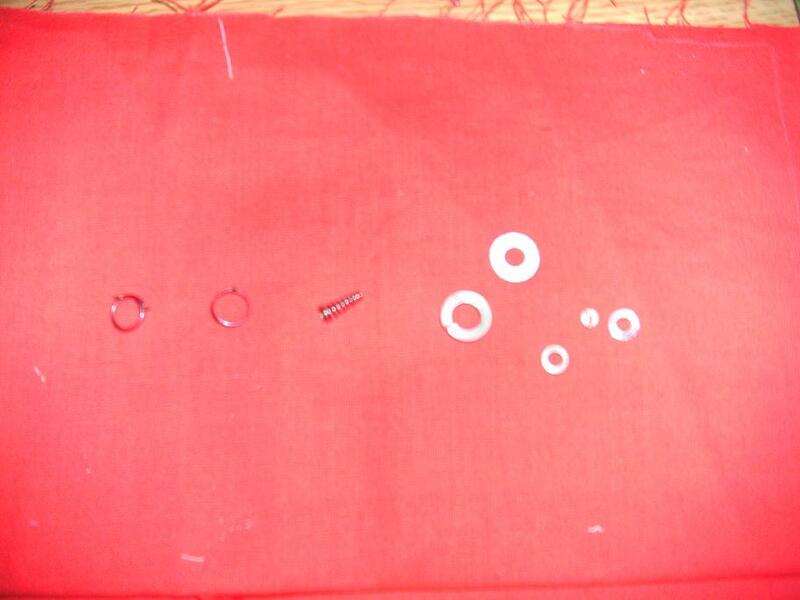 the first appears to be the plate that holds stuff together in the bobbin case--------but you ought to recognize it. No help here. I don't think they are extra, I think they are used somewhere in the machine. I'm a chicken and don't take many parts off. My son tells me that you are really good if you can put a machine together and have left over parts Especially if the machine works!! OK, the parts of the machine I have the most trouble with are the bobbin winders. Could these be springs for my Morse Fotomatic? 101 of basic maintenance. The first thing taken off a piece of machinery is put first in line, then the second right next to it then third all the way down to the last part. Every screw, nut, washer, etc is put in the line. To assemble, the last one off goes, on first. Thanks for the advice BellaBoo, if only I had done that each time. Sometimes I give my memory more credit than it deserves. Set your camera on movie mode and tape it when you do it, and make sure you do like above, putting them in order. Draw around them on paper to get the shape, and number the shapes in case it gets bumped? My memory hides too! Why, in heaven's name, do you take your machine apart? I wouldn't think of doing that! I always take it to a certified machine technician for repair. My machine cost way to much for me to fool around with the mechanics of it. And then, it would end up with the technician after all, so I just take it to him in the first place. I do clean out the bobbin area and oil it but that is all. I guess I am wondering why you take the machine apart? Cleaning perhaps? Most cleaning can be done with brushes or pipe cleaners without taking the machine apart. If it needs more through cleaning, I would recomend taking it to "the shop" Does the machine still work without these parts? I would worry about doing damage to the machine if it does. Maybe a trip to the shop along with the extra parts is in order. Awesome idea - although I don't take my machine apart - leave that for the professionals. is there a online manual? parts section? I have a Janome 8000 I bought in 1993. Two years ago the LED screen went out. Estimate to replace was close to $400. I went online, found the screen and instructions to replace for $100. I decided to try it myself. I replaced the screen and it works fine. I did have to have the machine serviced afterwards, but only a year or so later. As another do it yourself fixer, the spring looks like it might be part of the tension dial. I would look on the internet for the brand of the machine and see it they have a schematic for it. That has saved me many times! Maybe I'll open up my fotomatic today and see what looks similar! This is a vintage Morse I found for $15.00. It needed cleaning so I took it apart to do a good job. It sews very well now, just can't figure out the assembly for the bobbin winder. I have asked this question before and it seems no one here knows how to assemble it either. My three new rules for disassembling any part of my machines: 1. take pictures, 2. take pictures, 3. take pictures. I have never taken the tension dial apart on any of my vintage machines, so it probably isn't that, but thanks anyway. Thanks to all for your advice. I am determined to get this thing back together come hell or high water. I'll let you helpful people know when I do. Wishful thinking huh? The first are earrings, and they may irritate your ears. The third part might put a spring in your step (depending on how little you are) and the washers will not help your laundry. My DH is a mechanic and sometimes finds extra parts. Sometimes parts are necessary, so I'd suggest taking pics as you dismantle. Totally insane the number of parts he finds on his work bench at times!